The title and content of this post is taken from the name of one of my favorite children's books about nature: Nature in the Neighborhood, by Gordon Morrison. The book describes the animals, plants, and habitats associated with each season. This is not a book review so I won't provide a lot of detail but Morrison begins his tale with the emergence of earthworms in the spring and ends it with rabbit and coyote tracks. In between are illustrations and natural histories of toads, kestrels, goldfinches and thistle, monarch butterflies and milkweed, and cattails and ferns. 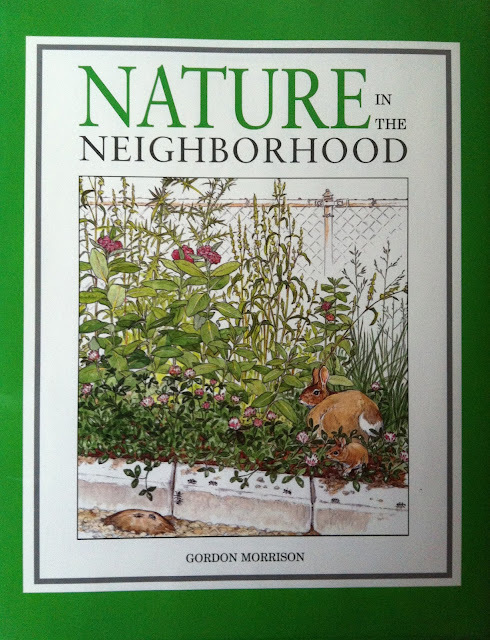 Morrison's map of nature in a neighborhood is fantastic and a portion of it is shown above. 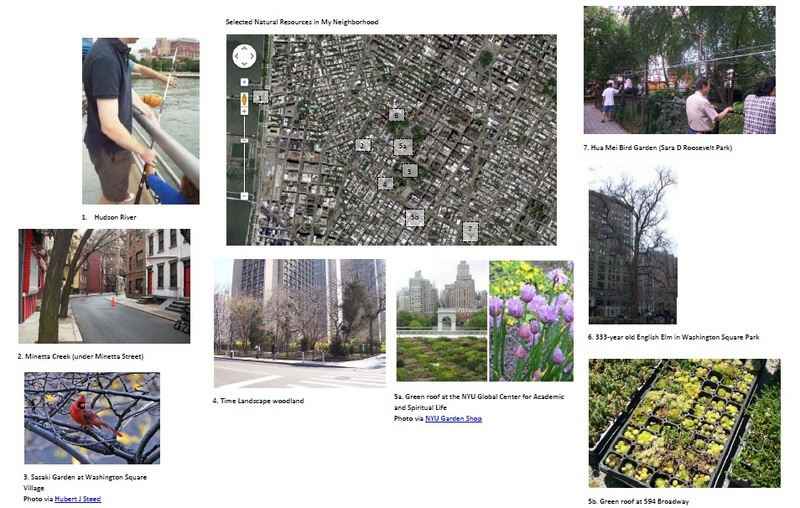 I've highlighted some of the natural resources in Greenwich Village and a bit beyond (see nos. 1 and 7), shown below. Big City Fishing offers a free fishing summer program offered at several piers along the Hudson River. Participants learn about river ecology by listening to staff talks, examining plankton under microscope, viewing fish they catch themselves or fish that others have caught (all fish are released into the river by staff), and identifying fish on the Fish Poster. Minetta Brook once ran above ground in Greenwich Village, flowing through the western section of Washington Square Park to the Hudson River. The route of the brook was altered and culverted in the 1820s. The waterway is evident in the curve of Minetta Street and flooded basements during some rain storms. The 1.5-acre Sasaki, Walker and Associates garden was completed in 1959 and is the park in which the Washington Square Village complex sits. The garden provides habitat to numerous species of birds including Northern Cardinal, Mockingbird, Thrasher, Catbird, Mourning Dove, Pigeon, American Robin, Yellow-bellied Sapsucker, Hermit Thrush, Sparrow (House & White-throated) and European Starling. 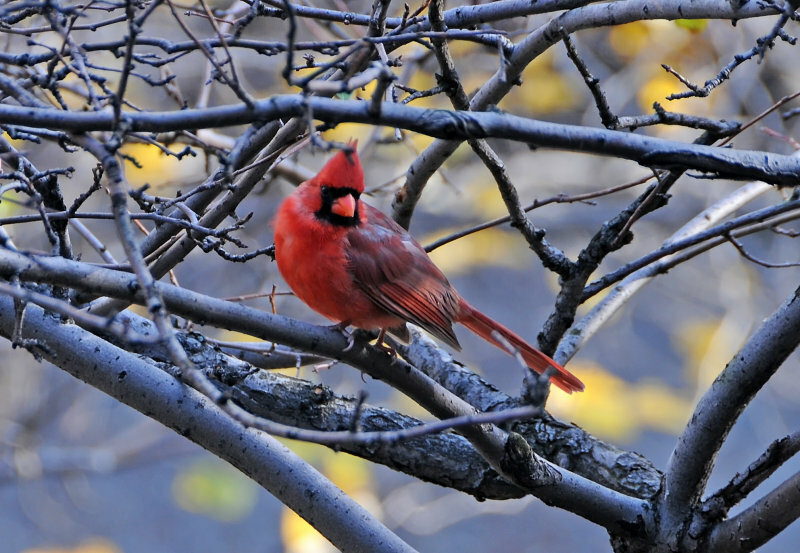 More information is available in "The Birds in Our Garden" report prepared by biologist Gabriel Willow. Alan Sonfist planted the Time Landscape, a 25' x 40' forest park, in 1956 to mimic a pre-colonial woodland in Manhattan. The roof garden at 594 Broadway was installed to to reduce the building's contribution to stormwater run-off and to reduce cooling costs. The plant palette includes Sedum album (white stonecrop), S. acre (goldmoss stonecrop), S. spurium (tworow stonecrop), S. sexangulare (tasteless stonecrop), and Sempervivum tectorum (hens and chicks) as well as ice plant was also planted. We wrote about the green roof here. View this venerable tree over the course of the Tree Year 2011. I heard about this bird garden when I first moved to the neighborhood but did not visit it until last summer. Most of the activity was along the exterior of the southern side of the garden. I observed several older Chinese men talking with each other and interacting with their birds. Check out this New York Daily Photo entry about the garden. Neighbors, what would add to this map? Would you like to guest blog about nature in your neighborhood? Send an email to info at localecology dot org or leave a comment. Thank you! Great post! I should do a post like this for our new neighborhood. Thanks for the inspiration! I will order that book. Any other must-have nature children's books you can recommend? Thank you, Kelly. I look forward to seeing your neighborhood nature map. Your question has inspired me: I will write about my favorite nature children's books.